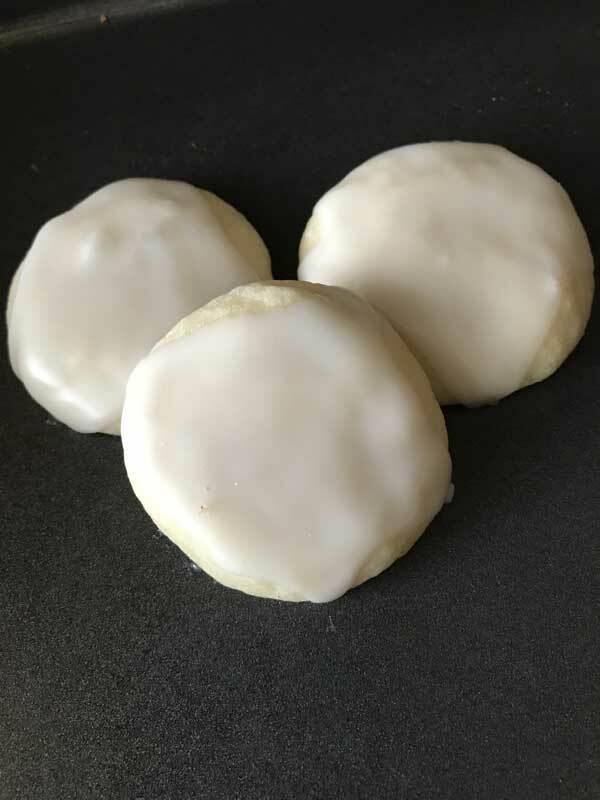 Almond Meltaways are like tiny sugar cookies with a sweet almond flavored icing that hardens. This version is adapted from a recipe by The Novice Chef. Combine the butter and sugar in a mixing bowl and beat with an electric mixer until light and creamy. Add the egg and stir until blended, then scrape the bowl and beat until fluffy. Gradually add flour mixture, stirring until fully blended. Shape dough into about 60 small (1 inch) balls. Place them about 2 inches apart on ungreased baking sheets. Flatten balls slightly and bake for about 8 minutes or until set. They will not brown, so don't look for brown edges. Let rest on cookie sheet for about 3 minutes, then carefully transfer to a wire rack to finish cooling. When cookies are completely cool, making the icing. Put the sugar in a small yet deep bowl. Mix the extracts and the milk, then add milk mixture 1 tablespoon at a time, stirring constantly, until mixture is opaque and creamy. Add more milk if needed.